What timing! I met with Jess shortly after she sent her email and we started working on a design plan for their little girl’s nursery. Jess originally was leaning towards a pink and green color scheme, but she ended up changing her mind to purple and gray. (Believe it or not, she made the color switch on her own!) Jess and Jason were such a pleasure to work with, and it was really fun for me to create a purple nursery, especially during my own pregnancy. The inspiration for the room started with the purple and gray bedding (from Pottery Barn Kids). The purple color in the bedding is a unique purple, and I found a perfect match to it in the fabric we used for the window treatments. The embroidered modern floral design was a soft and playful addition to the nursery. The beautiful window treatments were fabricated by Christine of Iron Gate Interiors. Jess found these adorable pom poms on Etsy ~ Bell Bloom Design. 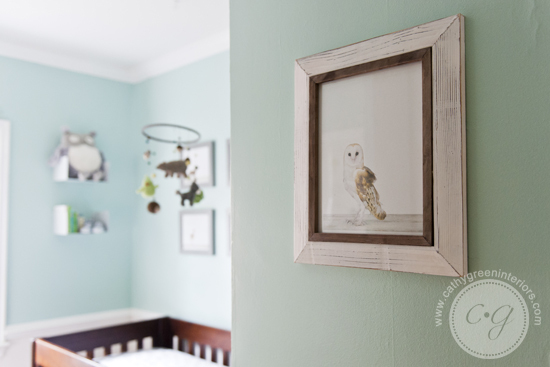 To complete the color scheme, we brought in a few pops of aqua to use as an accent color throughout the nursery. The dahlia wall flowers are also from Esty ~ Bed Buggs Boutique. Barden’s Decorating painted and meticulously stenciled the room. We also added an armoire to the room for extra storage. It was such a joy to work with Jess and Jason on their nursery. I love how it turned out! Congratulations Jess and Jason on the arrival of your sweet little girl, I hope she’s enjoying her new room! º What is your favorite part of the nursery? If you follow me on Pinterest, or if we’re friends on Facebook, then you probably know that I’m pregnant! Yes, Andrew and I are expecting a little boy in July. I’ve been gathering ideas for the nursery, and I plan to use a navy, green, and white color scheme. I have wanted to bring navy into our home since I wrote my two navy posts (part 1 & part 2) a year ago, and we decided this was the perfect opportunity. Here are a few rooms I pinned for inspiration. Carousel Designs has great nursery bedding options, and we've been looking through all of the navy choices. There are so many fun patterns to choose from, but here are two that we like. For the window treatments, I wanted to find a fun fabric that would incorporate both the navy and the green. This geometric pattern of random blocks in a variety of colors I think will be perfect. We have a ceiling fan in the room that I’d love to replace with a fun light fixture. Our ceilings are 8’ and Andrew is 6’5”, so any new light fixture can’t hang too low. I've found three choices that I really like. What do you think? I didn't want to have too much of a theme in the room, but we do like these whale and nautical sheets. They'll be a cute addition to the room, and something that will be easy to change out as he grows older. I also found these artic animal prints on Etsy that are really adorable. A penguin, a narwhal, a whale, and a polar bear, and you can choose the colors you want! Those are the ideas I've gathered for Baby Boy Green’s nursery so far. I’m still working on finding a rug, and we also want to find a dresser that we can paint and turn into a changing table. The nursery has been fun to plan and I can’t wait to see it start to come together. º What is your favorite go-to source for nursery and baby items?